I have a big head. Metaphors aside, my head is very heavy. Before suffering from chronic pain after two successive whiplash accidents, I wasn’t really aware of the enormous impact that the position and weight of your head has on the overall comfort of your neck. Pain and disability drove me to experiment with many healing therapies. What helped me the most was an increased awareness of correct posture; and then, strengthening and stretching my body to enhance that alignment. Pilates does that for me. Take for example the accompanying diagram: when it sits straight upon your skeleton, your head weighs about 15 lbs. Its weight upon your upper body increases as the head curves forward off your spinal column. Two such instances are when you are driving and lean forward to search for a sign and as you strain closer to read the screen of your computer. 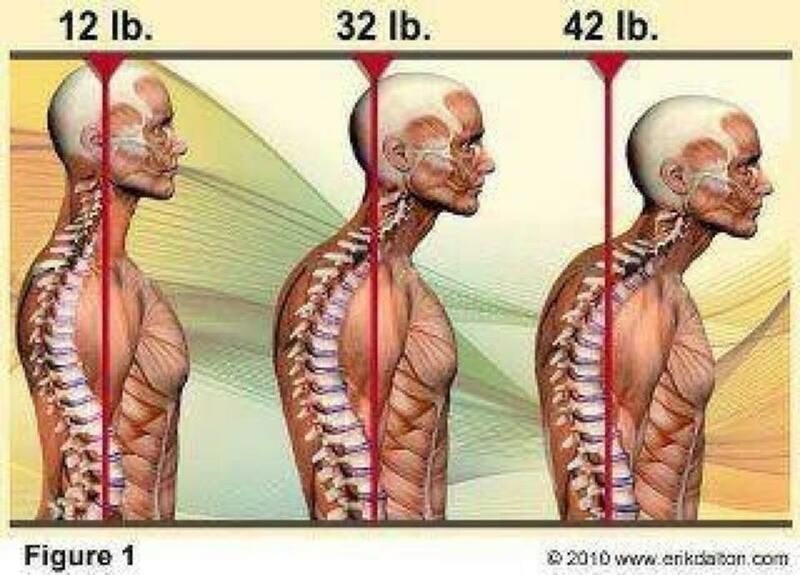 As it slopes forward even slightly, so that the back of your cranium is in line with the center of your spine, the weight of your head on your neck and upper body muscles increases from 15 to 32 lbs., more than double its actual weight when in alignment with your skeleton! If you follow that curve and let the head slope even more, so that the neck is curved forward off its spinal skeletal support, the weight your upper body soft tissue must sustain increases to 42 lbs. It is then no wonder that so many of my clients complain of neck pain after hours of incorrect posture in daily life! You can try to counter-balance that forward neck and shoulder slope with little mental reminders during your day. Try to feel your back, head, and shoulders against the back of your chair while driving in the car or sitting at your desk. Keep that upright alignment until you finish a task by lifting your lower back against the support and scooping in your abdominal muscles in and up. Imagine a red cord that connects the crown of your head to the ceiling and follow the straight line of the cord lifting your head and neck to align it with your spine as you sit, stand, or walk through a room. Notice the immediate comfort you experience as the alignment is corrected. 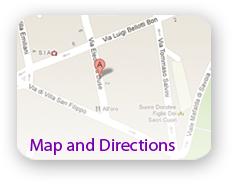 Fix that sensation in your muscle memory as your personal reference point. Being aware of your posture and exercising to strengthen correct alignment is a priceless investment in a healthy body and ageing well. Erect carriage and physical wellbeing create a youthful appearance no matter what your age, from 25 to 75! It is the first step to protecting your body against future physical discomfort and limitations. So… Sit up straight at the wheel or in front of your computer and find that straight red line from the ceiling through the crown of your head, neck and down the spine! Credits: Previously published in the American International Club of Rome’s newsletter.